Fine. 077775447026 INTERNATIONAL CUSTOMERS: International rate shown is for items that are 8 oz or less; heavier items will require additional shipping. Contact us if you have any questions. Chubby case contains 2 discs and booklet. Perfect except not sealed. Ask about discounted shipping available when multiple items are purchased at the same time. FAST, RELIABLE, GUARANTEED and happily SHIPPED WITHIN 1 BUSINESS DAY! Fine. 077775447026 This item is guaranteed to play perfectly with all original artwork and materials. U.
Camille Saint-Saëns. Very Good. In very good packaging. 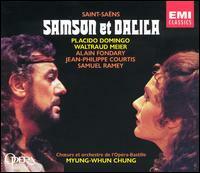 Saint-Saëns: Samson et Dalila. New. Brand new, still in shrinkwrap! (Shelf location: CY1) All items carefully packed to avoid damage from moisture and rough handling. Tracking included.